Chocolate Peanut Butter Cookies are a sweet way to combine two classic flavors. This week I am going through old content and updating posts (turns out my grammar isn’t super amazing and I have been going a little nuts with the commas). 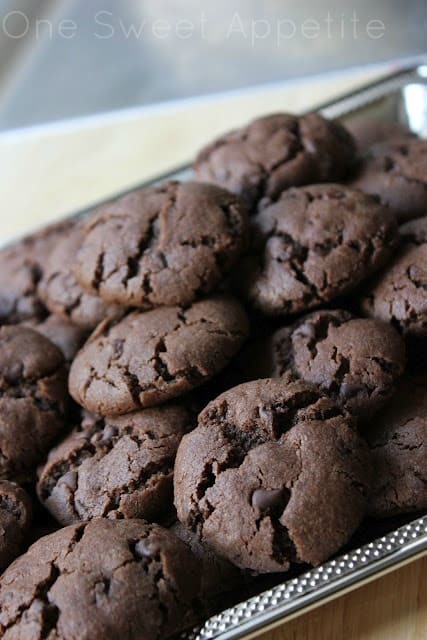 THIS recipe was my favorite cookie for years! I let it slip to the back of my memory and was ecstatic when I stumbled onto it today! I’m heading to a cookie exchange tomorrow and feel like this little gem needs to be my shared recipe. If you are a big fan of Reese’s you will love this little cookie. It’s the perfect marriage of two classic flavors. They blend so well together and the chocolate slightly outshines the peanut butter. It is like taking your favorite peanut butter cookie and giving it a boost of awesome. I like to use this as a go-to for when I need to take a quick treat to friends or neighbors. I have never met a person that did not instantly fall in love with the soft chewy texture and sweet/savory combination of flavors. Package it up in a small little bag or cute decorative box, top with a bow, and make someones day! Preheat your oven to 350 degrees. Line two cookie sheets with parchment paper and set aside. Whisk the flour, cocoa, baking soda, and salt in a medium bowl. Set aside. Beat the butter, sugar, and peanut butter in the bowl of your electric mixer until light and fluffy. Add the eggs and vanilla and mix well. Stir in the dry ingredients until fully combined. Fold in the chocolate chips. Drop dough by heaping tablespoon onto your prepared tray (roll into a ball if you'd like a more round shape). Bake for 10 minutes and enjoy.